The BillyOh Expert Tongue and Groove Apex Workshop is a very smart looking workshop. 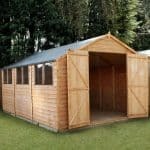 As part of the BillyOh line, it has a classic shed kind of style and a very smooth look, making it something that is going to look fantastic in any garden it stands in. This is a very good sized workshop. It offers you plenty of space to tinker around with various DIY projects, maybe use as a painting studio or maybe even as some kind of man cave! The space this structure offers would also make it ideal for use as a storage shed as you would be able to fit in many, many items inside. It has a very welcoming personality thanks to the large double doors and four fixed windows that will allow in plenty of natural light. The tongue and groove shiplap cladding that has been used to make this workshop is not only easy on the eyes, it is also very thick, strong and watertight. This, along with the frame that it is connected to, makes the workshop one very strong and long lasting structure. One of the things that many people like about the BillyOh line is the way that you can have some input on the design and make sure the workshop is made just the way you like it. The BillyOh Expert Tongue and Groove Apex Workshop is a workshop that we really do like. 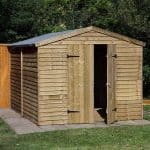 We just love the overall design of it and think that the classic shed design is something many people like. The depth of this workshop is 7 feet 9 inches and the width is 9 feet 11 inches so as far as the floor space goes, you have a lot of room to make use of here. It is this kind of floor space that makes this a structure that works as both a workshop and a storage space. The eaves height of the workshop is 5 feet 8 inches, which is right around what we would expect. The ridge height though is 7 feet 8 inches. We really like this as it makes moving around the workshop not require you to be hunched over, so you can easily spend an hour or so in here tinkering with a project or just pottering around and not have a sore back as a result of doing so. Here at WhatShed, we love a nice and long apex roof. The standard roof that comes with this workshop is a solid sheet boarding comprised roof. This kind of boarding is usually around 8 mm thick. This is not the best roof in the world, but it is the standard kind of roof boarding that most sheds and workshops use. If you want a better looking roof, then you can get a 11 mm thick tongue and groove roof for an extra cost of £37.99. This is actually a pretty reasonable price to be honest and worth considering if you do not like the basic look of solid sheet boarding. 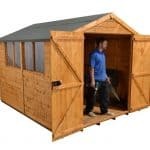 You can even take things a little further and go for the heavy duty roof which costs £64.99. The BillyOh Expert Tongue and Groove Apex Workshop has been made with 12 mm tongue and groove shiplap cladding. We really like the look of this cladding and feel that the smooth design really does give the workshop a lot of personality. The cladding is not just there to look good though, as it is also watertight as this kind of cladding makes it impossible for rain to get inside. Like many other BillyOh products, this one does not actually tell you what the size of the framing is. In our experience and from what the pictures show, it does look as if they have used their standard 28 mm x 28 mm framing, which is fine by us as this is a very strong kind of frame that will certainly make sure the workshop is strong and long lasting. Like other BillyOh products, the asking price does not actually include a floor. Why BillyOh does this is a mystery to us, but they do. You have to add a floor as an extra and they have three different floors to choose from. 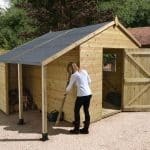 If you are on a budget and just want something cheap and cheerful then for £89.99 you can have solid sheet boarding which is the same kind of boarding as the basic roof. For £104.99 they have a tongue and groove floor which is an impressive 11 mm thick. This is a great floor that is able to take a lot of weight and also has a very smart look. They also have a heavy duty floor which is 19 mm thick. This is some of the strongest flooring that you can get, but at £179.99 it is also very expensive. 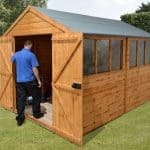 If you just want the workshop for general garden storage, then we think you will be fine with the standard flooring, but for a workshop, we would suggest thinking about the tongue and groove flooring. When the BillyOh Expert Tongue and Groove Apex Workshop is delivered the wood will be protected with a basic dip treatment. This is pretty standard these days and it will require you to give it a coating of wood treatment shortly after you have installed it. To really look after the wood, you will want to give it a coating on an annual basis. It sounds a lot of work, but it really is not. You get a generous ten year anti rot guarantee with this like you do most BillyOh products. This guarantee is only valid, though, if you treat the wood properly. So if you do not treat the workshop and then rot appears after a couple of years, chances are you won’t be covered! So make sure you treat it properly. The double doors on the front of the workshop are one of the most impressive aspects of this workshop. Even when you add in the price of the floor, which takes the workshop to over £500, the fact that they went that extra mile and put double z framing on each door is very nice to see. At this price we would expect doors with just standard support, so seeing the double z frames was great. The doors offer you 5 feet 5 inches of height and 3 feet 8 inches of width, which we feel is more than enough room for getting things in and out. This workshop does come with four fixed styrene windows, but there is a slightly cheaper fully boarded version of this workshop also. We think the windows are fine and if you are using this as an actual workshop, then you will be thankful of the natural light these windows let inside. The only thing that keeps the two large double doors closed is a turn button catch. Now to be fair this will keep the doors closed far better than you would think, even a strong gust of wind will not be able to open them, but it does mean if you want to put more expensive things in here like tools, bikes or even a special project you are working on, you will have to add a padlock of some kind. All of the windows are located on one side of the workshop and they are quite large so it is fairly easy to look inside. Some blinds or even just a bit of cheap fabric would do the trick if you do want some privacy. Also, there is always the option to buy the workshop fully boarded which will also save you a little bit of money as well. There are many different colours for you to choose from with this workshop. It is important to note that the workshop will not be delivered to you painted. You just get the tub and have to paint it yourself. In total there are 12 colours to choose from. More basic colours like dark brown and harvest gold are £19.99, whereas more, let’s just say interesting colours like American barn red and gunmetal grey, cost £54.99. You can also add a bit more colour to the workshop by having a coloured trim. You have a choice of black, cream and slate grey. Each one costs £12.99 and can really finish the workshop off perfectly. 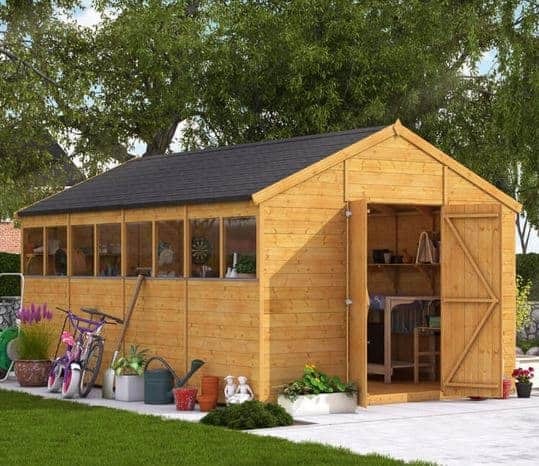 The roof and floor, we have already talked about, but there are other extras such as shelving, guttering, a shed base and locks that can all be added. There is a lot to look at here so make sure you take your time and really think if you need any of these extras before you add them. We are happy with the general quality of this workshop, but if you were to upgrade to a tongue and groove roof and floor, you could actually increase the score to a 9. As long as you treat the workshop like you are supposed to, then we feel you can actually get a lifetime of use out of this workshop. This is a very good sized workshop. It offers you plenty of space to use, but at the same time it is not overall huge so it will not take up the whole of your garden. 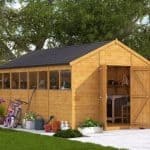 You will need a friend to help you with the installation, but this is no more awkward or difficult than any other 8 x 10 shed or workshop we have seen. Just be sure to take your time and put aside around 8 hours to get it done properly. Even when you add in the extra price of the floor, this is still a very decently priced workshop. As long as you do not go too crazy with the extras and the upgrades, then it is actually very affordable. Final Thoughts: The BillyOh Expert Tongue and Groove Apex Workshop is a workshop that we really like. It is good to see a classic looking garden structure every now and again and that is clearly what the designers intended with this. Even in the most basic form, we still feel that this is a workshop that has a lot to offer and it is not all that expensive either. Then on the flip side of that, if you do go all out and get the best floor and roof, then you will actually have one very high quality workshop on your hands. If you do not mind looking through all the different options and extras, then this is a workshop that we highly recommend you take a close look at.